It used to be a maxim in comics that you should write every issue like it was somebody's first. Grant Morrison, meanwhile, writes every issue like you've already heard the story before and he only needs to gloss over the highlights. For instance, the International Club of Heroes - aka the Batmen of Many Nations. When they popped up during Morrison's run, the only way you'd know they were all pre-exiting chtacters was if you'd actually been reading comics in the mid-50s. Realizing he can't fight evil alone, Batman teams up with an array of heroes across the globe. Traveling the world, testing and training a strong team, Bruce Wayne builds a nearly unbeatable network of crimefighters. Though he wasn't a member of the Club the first time they appeared, Man-of-Bats was still a prexisting character. 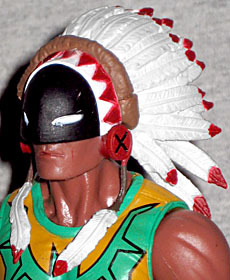 Great Eagle first appeared in Batman #86 (1954), where he was Chief Man-of-the-Bats and dressed exactly like Batman, with the exception of a feathered headdress. His son Charlie served as his sidekick, Little Raven. He lived in a teepee, he ran around countryside that looked like it came out of F Troop, and was basically exactly what you'd expect a 1950s Indian Chief Batman to be. In his second appearance, 53 years later, he was a less horrible character; he was now Dr. William Eagle, he didn't speak like a Looney Tunes indian, and he was much less of a direct Batman clone. He still had the headdress, though. Not all Indians wore headdresses like this - only about a dozen or so in the Great Plains region. Fortunately, William Eagle is Sioux, and they're one of the tribes that did. Man-of-Bats is wearing a "halo," with feathers fanned out around the face in an oval shape. War bonnets were made from the tail feathers of the golden eagle, with each feather being earned for an act of bravery. Man-of-Bats has a black half-mask covering the upper part of his face, to conceal his identity, and has two dangling feathers falling onto his shoulders. Man-of-Bats was sculpted by Mike Locascio, just like Knight. This costume first showed up in Batman #667, so we can assume the redesign is the work of JH Williams III. 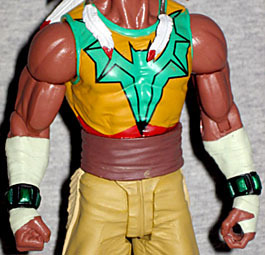 The outfit comprises buckskin pants with (sculpted) fringe down the outsides, leather boots with laces up the front and more fringe around the tops, a thick sash around his stomach, wraps on his hands and forearms, black bracelets with green gems, and an orange shirt with a large teal bat covering the entire torso. It's a very cool update, at once saying both "Native American" and "Batman." Bruce would never abide the bare arms, but on Dr. Eagle they suggest a certain hardy toughness, kind of like a bodybuilder who cuts the sleeves off his shirt. The fine details of the sculpt are all very good, but the legs and groin don't quite match: they're slightly different shapes, and the wrinkles can't line up. The figure doesn't skimp on the articulation. 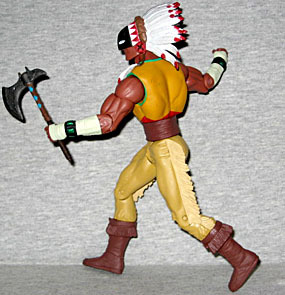 Like most DC Direct figures, he has a balljointed head, swivel/hinge shoulders, swivel biceps, hinged elbows, swivel wrists, a T-crotch, and hinged knees. Like many DC Direct figures, he has swivels in the shins. Like very few DC Direct figures, he has a waist. A waist! There was a time when DCD would have absolutely skipped the waist, even on a figure with a big, obvious place to put a joint (like Man-of-Bats' sash). The range of motion in the neck isn't the greatest, but believe us, it is a balljoint. We also get an accessory, though it's not one that's appeared in the comics: it's an axe, designed to look slightly like a bat. In other words, it has two little "ears" at the top. The blade has a pitted texture, suggesting it's made of stone, and there are intricate patterns on the wooden handle. The peg on the end makes it look like it was designed to plug into something, but there's nothing immediately apparent. The axe is a very nice piece, and suits him well. And of course, there's a black disc base to stand him on, if you want. We may give Morrison crap for his writing, but the Batmen of Many Nations was a good idea to reinvigorate. We get lots of previously lame characters rescued from the junk heap, we get cool new costume designs, and we can get fun toys that allow DCD to sell "a Batman" without actually having to sell Batman, you know? Though there is a Batman in this series, for whatever reason. Hopefully there will be a Series 2, so we can get Nightrunner and some of the others.